Recently at least three people asked me about the tips how to learn the Georgian language. Being very sincere, I’ve never learned it properly: having thrown myself into the local life, I had to start reading and writing, and if I didn’t understand some grammatical issues, a great professor of linguistics, Tako Mghebrishvili, was there to help. The language is very old and quite complicated. Even if you are not staying here forever, during your trip around the country you might learn some basic words such as “gamarjoba” for “hello” and “madloba” for “thank you”. I decided to teach you some seasonal words that might come in use, if you decide to visit our country this fall and winter. (By the way, the cover picture of the post with khurma (ხურმა) a.k.a. 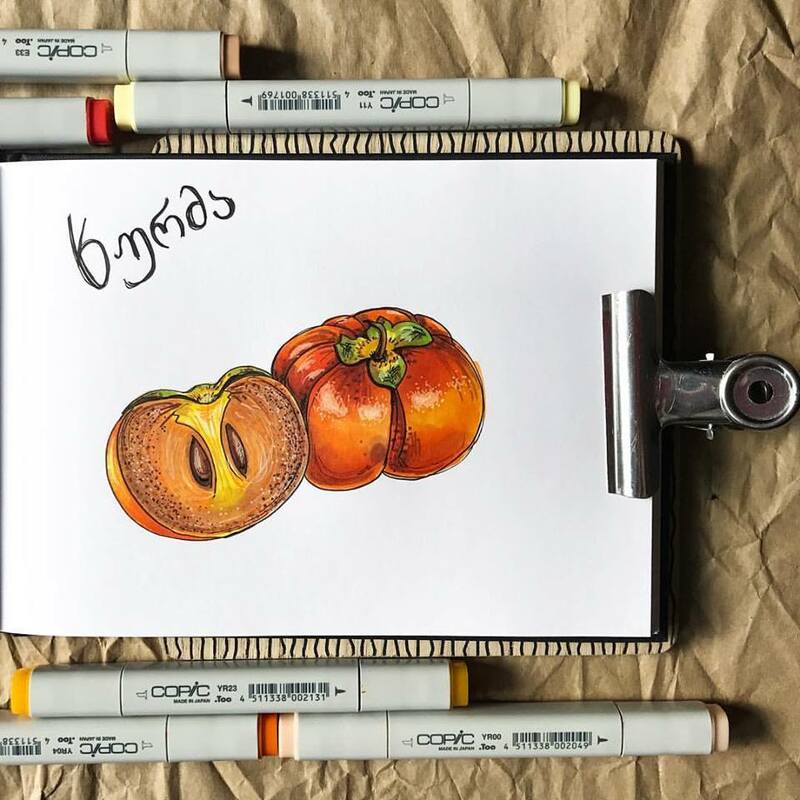 persimmon is made by Evgenia, who is drawing the loveliest sketches featuring pieces of Georgian reality. I am totally in love with them, and if you want to see more, visit her page here: PIUWIU). And, here we go with the basic non-trivial Georgian lexicon! 1. Shemodgoma (შემოდგომა) means “autumn”. The beginning of this season in Georgia looks like an extended version of summer. September is really warm, so you can still go for a seaside or mountain vacation. The temperature remains between 27 and 30 degrees, and only the slowly changing colours of trees will remind you that it’s still fall. But in October severe winds will remind you on who is who! 2. Rtveli (რთველი) means “harvest”. Almost every Georgian family makes its own wine, that’s why rtveli is a very important period of life that starts from late August and lasts till the late October. The grapes in Western Georgia are usually ripening a bit later. If you are lucky, you can participate at harvest too! 3. Tchuri (ჭური) means… well, it means “qvevri”, the clay vessel that is the key element of Georgian winemaking technology. But this word is used by the Western Georgians. If you are in Imereti, Adjara, Samegrelo or Guria, use it, and you will gain the love of locals and maybe a glass of wine, too! 4. Mta (მთა) means mountain or mountains. Winter sports lovers flock to Gudauri, Goderdzi and Svaneti to practice their freeride skills, while families are rather choosing Bakuriani. 5. Tovli (თოვლი) means “snow” and is seen usually in the mountains. Snowfall in the cities such as Tbilisi, Batumi and Kutaisi is quite a rare thing that happens just a couple of times per winter. Though, our ski resorts are usually full of snow, especially in January, the end of February and even in April. 6. Chichilaki (ჩიჩილაკი) is a Georgian New Year Tree that looks in a very unusual way. It’s a tree-shaped curly wooden object that is made out of walnut or hazelnut, that symbolizes the tree of life or the beard of St. Basil. 7. Sachukari (საჩუქარი) means “present”. The best sachukari from Georgia is wine or churchkhela, if you like to bring the edible objects to your loved ones. Blue traditional tablecloths, jewelry made of minankari enamel and cloths made by the local designers are for those who want something really unique. 8. Alilo (ალილო) is the Georgian Christmas carol. Though, it also means the Christmas parade that takes place in villages and towns of Georgia. 9. Gilotsav(t) akhal tsels! (გილოცავ(თ) ახალ წელს!) – Happy New Year. Adding -t makes the verb polite or plural. 10-11. Jandaba! (ჯანდაბა!) is a very useful exclamation. Better not to say it in a noble society, but if you wake up after a big party and your head is aching, you moan “jaaaandabaaa…”, wash your face and crawl to the next sakhinkle (სახინკლე) – a restaurant that serves khinkali, the best hangover food. The exclamation also works for the situation, when you dropped a glass, stumbled upon something or the taxi driver didn’t let you pass. The blog format doesn’t let me teach you more useful coarse words, but you always have a PM option. 12. Mze (მზე) means “sun”, and usually it’s still here in fall and winter. I would have joked that it’s the only difference between Georgia and Europe, but I’m afraid you won’t believe me. If you find მზე written on the wall or fence, don’t be deluded: it’s not a fascinating reminder on pagan times and worshiping solar deities, but a replacement for another three-letter-word that means a body part and is not usually mentioned. 13-14. Utsnauri (უცნაური) – my favourite word that means “strange” or “weird”. Its sound is as weird as its direct meaning. You can find a lot of typical Georgian things quite utsnauri, from amounts of wine consumed during one supra (სუფრა, big fat feast) to the speed of starting friendships, but at the same time it’s what makes you come back once and again. 15. Autsileblad (აუცილებლად) – “sure”, “of course”. Will you come to Georgia? – Autsileblad!